Your whitefish dinner simply has to include potatoes…but I do mean simply. Boiled new potatoes often find themselves on a plate next to whitefish, but sometimes they taste downright blah. No more blah potatoes! Cooked properly–in salted water and never overcooked–your new potatoes will taste great through and through. Toss with some chopped herbs like dill, and you will hit a home run with the greatest of ease. Wash then halve or quarter the potatoes evenly. Cover in a large pot with water, add a tablespoon of salt, and bring to a boil. Cook just until the potatoes are tender and not falling apart (it doesn’t take long, about 8 minutes depending on your potato size; keep checking and checking for doneness). Drain. Place back on the burner uncovered for 30 seconds to steam off any excess water. Remove from heat. Add olive oil, salt, and pepper. Toss with chopped fresh dill. 3 Responses to "Whitefish dinner: New potatoes with dill"
I do love dill! It’s my favourite fresh herb with fish. I always use it with salmon fresh or smoked. Your potatoes look fantastic and I’ve water in my mouth.I’ll try them asap. Have you ever sprinkled an omelet with dill? Delicious! Thanks for the tip for making not blah potatoes. These look just like my mother’s Ukrainian recipe! Except she uses butter instead of oil, and throws in a pressed clove or two of garlic in with the chopped dill. It’s the easiest thing, and the smell is incredible. 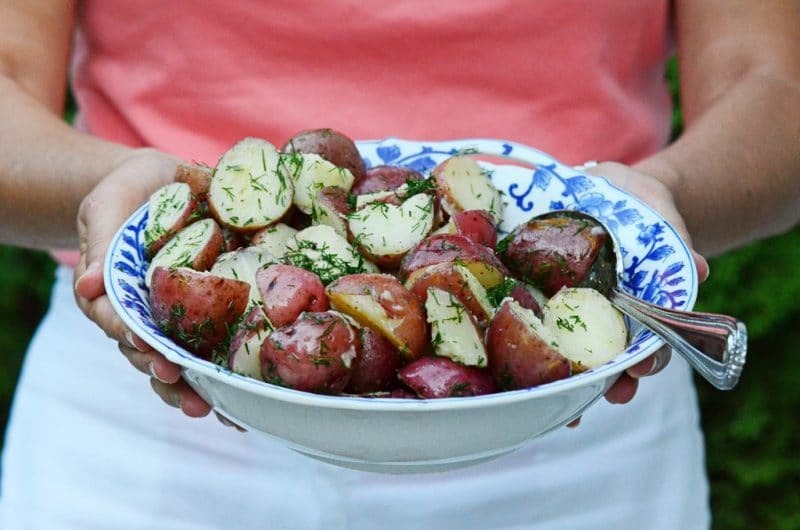 Dill is such an easy way to really elevate boring old (new) boiled potatoes.